Hey everyone! As you know AXELOS rolled out the ITIL 4 February 28, 2019. The ITIL 3 will be retired June 2020. 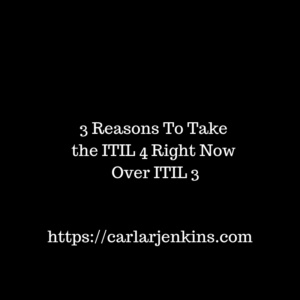 I have both ITIL certifications but these are my 3 reasons why you should take the ITIL 4 right now over the ITIL 3. ITIL 3 is going away. Why not take the ITIL 4 right now in 2019 and not have to worry about changing over in 2020? The ITIL Foundation does not expire until the next iteration. Once you pass the test, you don’t need to pay any money to renew or take professional development courses. I have to pay money to renew my Certified Scrum Master and I have get 60 professional development units to maintain my Project Management Professional. Right now there are not too many ITIL 4 certified professional. This means that you could probably be the only person who has it in your company. This means that you will be first. There is a LOT OF POWER in being first. Armed with the ITIL 4, you get to set the standard which all others are judged. Remember, you never get a first chance to make an impression. Why not leave an impression being getting your ITIL 4? The list goes on and on. You get my point. The ITIL 4 equips you with the skills to solve all of these problems. These are three of my best reasons why you should take the ITIL 4 over ITIL 3. Your future will thank you for it.